The one really good thing about this age thing, at least now I have decent health insurance thanks to qualifying for Medicare. 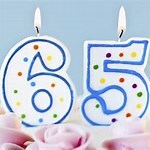 My insurance man said he has never seen so many people happy to turn 65 because now they feel they can get the care they need and deserve because they have decent coverage. It is kind of sad when you think about it that you have to get old to be able to afford health care but I will not get on a soap box today, that is a topic for another time. Reflecting on things though I have to say I cannot complain about my life. Certainly I have suffered losses, struggled during hard times, had my share of illnesses and bad days, but overall I have been fortunate. I have had just as many happy days and things to be grateful for and they outweigh the bad times. My parents both lived to a ripe old age and I am still able to work on my business every day and see a good return on my efforts. Sometimes I think how nice it would be to retire but then I think, I’d be bored to death if I wasn’t working. What would I do with myself all day? I am not a “busy” person with a lot of projects going. I could volunteer somewhere I suppose, but if I am going to do that I might as well keep working. Besides, I still enjoy helping people find their perfect home or sell one so they can move on to the next step in their lives. It is gratifying to help people make their Real Estate dreams come true. So on this day I want to say Thank You for my blessings. I still have my health, my work, and my loving husband by my side. I can still do most of the things I have to do and take the time off to enjoy the things I like to do. I have many people who have supported me through the bad times and helped me get back on track when I faltered. I have a few good friends I know I can depend on and enjoy spending time with. Overall, on this day I have much to be grateful for and I intend to enjoy every minute of my special once a year day. Thanks for reading, until next time…….